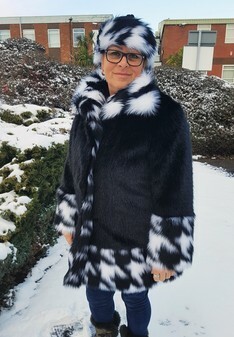 For Town or Country our Fabulous Faux Fur Jackets are a versatile mid length jacket to dress up or down. For cold and crisp county walks or elegant nights out. Made with loving care in our UK Studio - The jacket is a generous 78cm (31 inches) long* with 2 hidden pockets and 2 hidden fur clasps. The generous collar can be worn up for extra protection on windy days. For added warmth and to block windy gusts we also make our full length faux fur jackets with a generous face framing hood.